Plastic water bottles have become part of the daily routine of millions of Canadians. Cleverly marketed by major beverage companies, bottled water targets consumers looking for a convenient refreshment while also fulfilling the daily recommendation of water required as part of a healthy lifestyle. The global market is valued around $60 billion with a volume of more than 225,000,000 cubic metres. Despite the perceived benefits to consumers, bottled water has many negative environmental and economic impacts. The production of plastic bottles in the United States alone required the equivalent of more than 17 million barrels of oil, before accounting for transportation. In addition, the process emits over 2.5 million tons of carbon dioxide. The companies argue that the bottles are recycled, therefore limiting the impact; however, 38 billion water bottles end up in landfills every year. In addition to the environmental impact, consider the cost borne to consumers. For example, the cost of most 500 mL water bottles in Canada is approximately $2.00. Especially in developed countries, we have readily available access to free water in public locations and very low cost from our household taps. Yet, people prefer to “buy and toss” plastic bottles over bringing a refillable container with them. 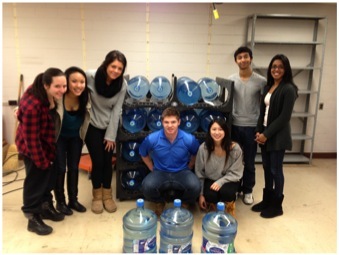 During the week of November 19th 2012, the Ivey Sustainability Club, led by Co-Presidents Patrick McNaught and Nicole Harvey, launched an initiative to reduce the purchase of single-use plastic water bottles on our campus. Canadian Springs donated 600 refillable aluminum bottles and water-refilling stations were installed in student classrooms. The initiative aimed to create awareness of the negative environmental impact of plastic water bottles, as well as the economic savings from refilling bottles at water fountains. Over the period of 3 months, students saved approximately 2,200 MJ of energy, 500 kg of CO2 emissions, and over $4,000. For each single-use plastic bottle equivalent (500 mL) that students consumed using their refillable aluminum bottles, Ivey's Centre for Building Sustainable Value donated funds towards the purchase of a permanent water refilling station in the new Ivey building. The success of this initiative allowed students to learn that choosing sustainable daily habits is not only positive environmentally, but can also create economic benefits.